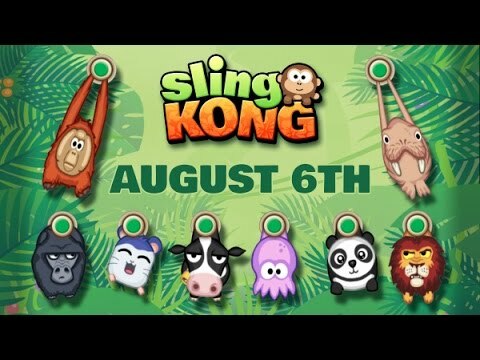 Sling Kong mobile video game is an Arcade game designed for Android and iOS mobile platforms. The free game was developed by Protostar and was released on August 6th, 2015. The genres of Sling Kong are Action and General. In the mobile game are funny heroes such as Pig, Chimp, Jellyfish, and more than 140 other such characters. In the phone, the game requires permissions to access storage, approximate location, camera and record radio. The storage allows the player to share their images with other players. Access to your approximate location is to allow the game to tailor-make advertisements that are more suited to you. The Camera and Record Audio is for customizing your Kongs by taking photos and recording audios. Sling Kong gameplay is not complex at all. The task of the player is to make your way through a track that is infested with traps by using a slingshot. While doing this, you aim to beat your high score and collecting coins. You challenge your friends in the form of other players and try to be the greatest Kong Slinger there is. You can sling, swing, and bounce your Kong to stardom. As you do this, you must watch out for all kinds of obstacles and dastardly traps. Have your character jump up, up and up to the highest height there is to go. If not, you get to reach your end much faster. The game even allows a player to take a selfie and use it to come up with their own Kong in the game. Another hilarious side of the game is the capacity that a player has to create Kongs of their family and friends. These Kongs can be dressed up with fun and lovely accessories. There is numerous accessories’ combination running into thousands. When swinging your hero, shoot him up as if he’s shot from a catapult. To get more famous, you can make your through by moving from one support to the next. The secret is to watch out as you move because there are other dangers that can end your journey prematurely. These include sharp saws, platforms in motion, and flaming touches among many others. You get to earn bonuses and unlock other crazy and funny characters such as the sheep, pigs, jellyfish, and even lions. The hooks that you jump on disappear, or deactivate after a while. The higher up the mountain you go the more the number of obstacles you encounter. They also become more dangerous. There are as many as 35 funny heroes in the game that a player can play as. The one that you’ve chosen influences how high up the mountain you’ll get to reach. There are up to 140 different characters in the game that you’ll interact with as your opponents. If you make a good game by jumping much higher on the mountain than other players around the world, you get a number of bonuses that you can use to reach a high record. You play with a character in the form of a Kong. However, you can create your own out of friends and family and dress them by using the many available accessories. If you love very cute but challenging mobile games, Sling Kong is for you. it’s no doubt a good game to spend your time with.